People have always been fascinated by sports statistics, and with the recent popularity of fantasy sports there is an increased demand for custom analyses of the sports data. 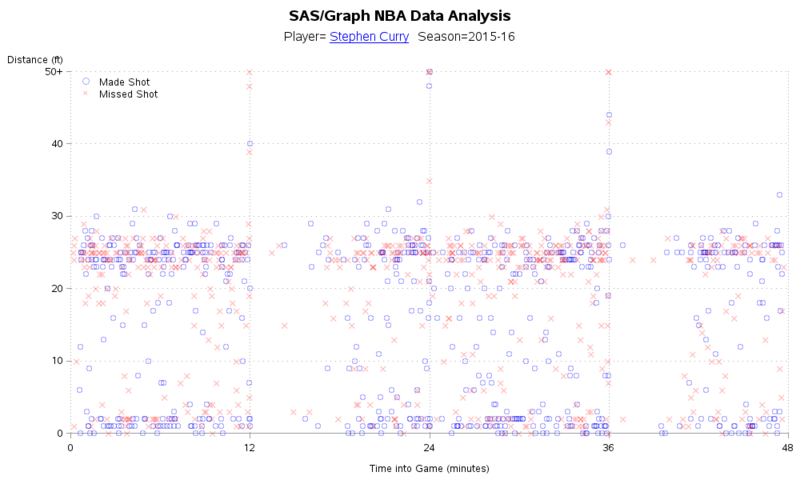 With those folks in mind, I have created a simple example that SAS programmers can use as a starting point for analyzing NBA data. 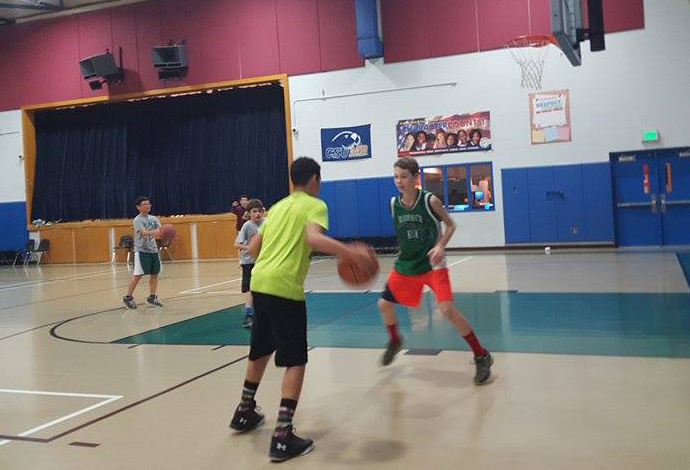 Before we get into the nitty gritty details, here's a picture of my friend Simone's son playing basketball (in the bright shirt, with the ball). He's tall, in shape, and smart, so I think he'll do well in basketball. 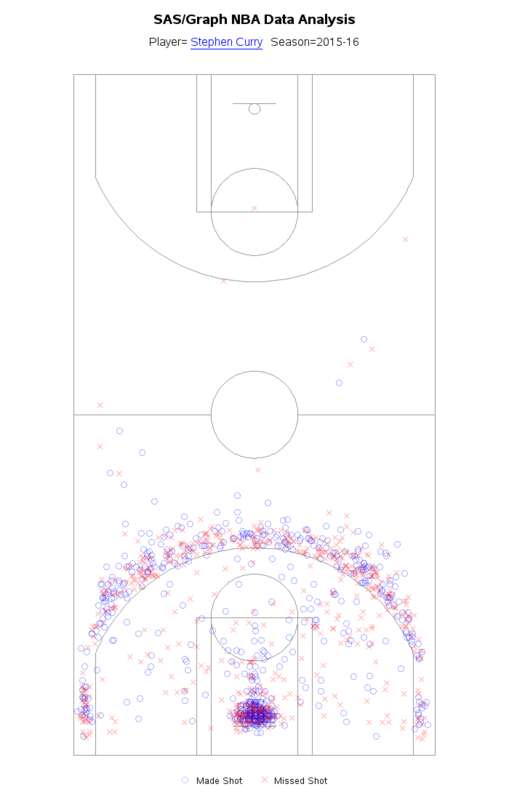 Who knows, maybe one of these days we'll all be plotting his data in our NBA graphs! 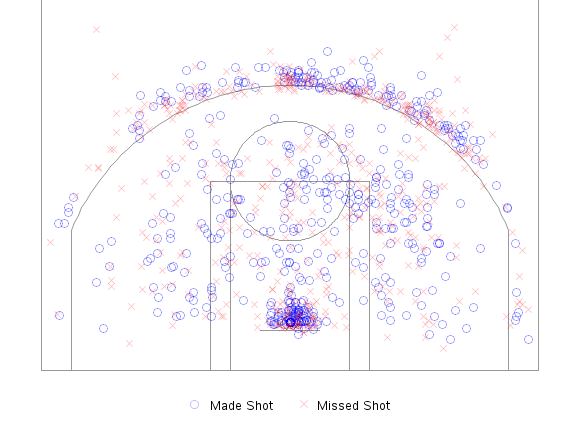 I had recently read about some examples that demonstrate how to use the Python and R programming languages to analyze the NBA data, and decided to try my hand at using SAS to do something similar. With a bit of digging, I found the magic url that can be used to download the data for a specified player & season. I then wrote some SAS code to import the data directly from the Web page, into a SAS dataset. The Proc Gmap approach is a good starting place for a spatial analysis, but how about analyzing the data over time? It was a simple matter to feed the data into Proc Gplot, and generate the following. 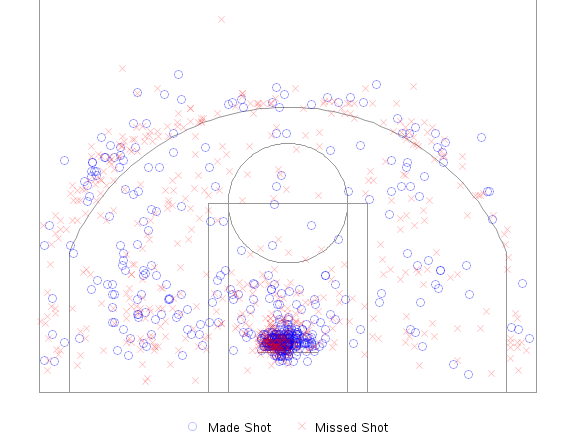 Do you notice any trends in Stephen's shot data? 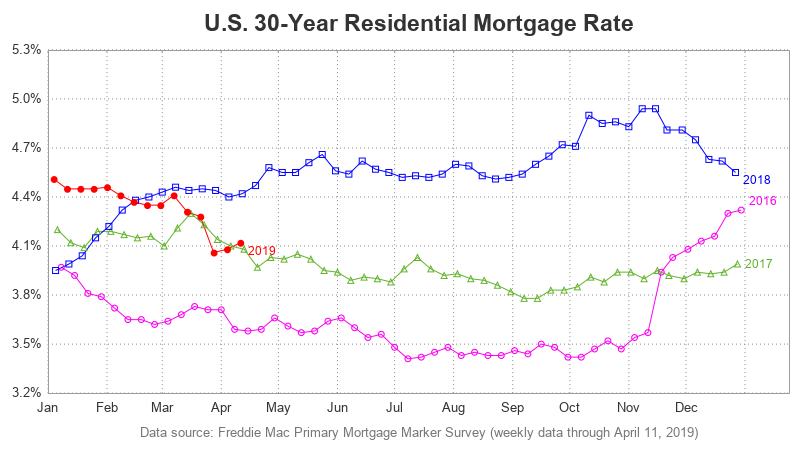 Can you explain the outliers? 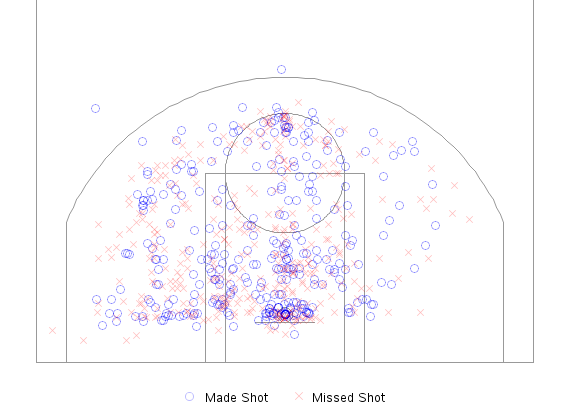 Hi, kind of resurrecting a two year old topic here, but I'm working on a group project for an analytics class based on nba shot data and this would be immensely helpful for us. Wondering which SAS tool you used to create this, and whether any trials would be accessible? 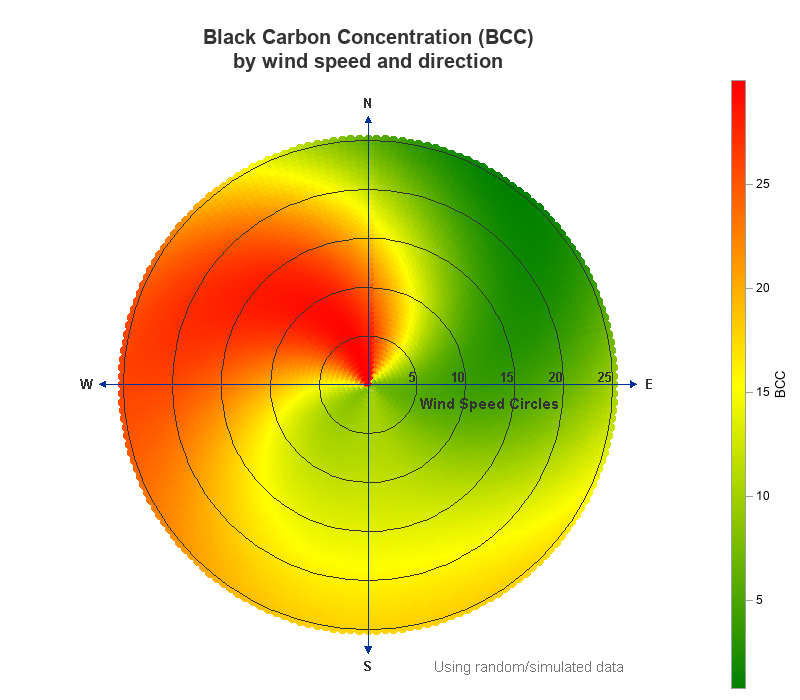 I used the SAS/Graph product. Unfortunately it's not available in our free/trial university edition. The ironic thing: In 2016-17 Marc Gasol started shooting 3's and his chart probably looked a lot like Durant's. I wanted to imitate your work, but the code doesn't work! There was no observation in 'my data', and I am poor at SAS, so I could not find what is the problem. How did I find all player IDs? Wow, really clever. I have to tip my hat off to you. Great work buddy. How did you find that url? So cool! I went to Virginia Tech with Stephen's father, Dell Curry, before the school became well-known for its football program. Dell was year ahead of me. Very cool - such a small world, eh!? !